Every day is Christmas as Rick Perlstein travels our great nation flogging Nixonland. His new tellings of old anecdotes unfold amidst his amazement at people’s lack of knowledge about Richard Nixon’s sordid roots. Newest example: Perlstein being asked again and again about king of all media and 1968 Nixon advisor Roger Ailes. “A good, mean, Wallaceite cab-driver. Wouldn’t that be great? Some guy to sit there and say, ‘Awright, Mac, what about these niggers?… Ailes walked up and down a nearby taxi stand until he found a cabbie who fit the bill. A promised summer exhibit of entries is postponed, but White House Redux contestants will be battling it out for the favor of judges until Fall. The goal is redesigning the two hundred year old presidential mansion to reflect it’s present lofty status. There are 831 contest entries, and the friskier of them are deployed on the youtube. Some plumb the depths of public ignorance on where the White House is located, while others set the house free to wander the countryside. The George W. Bush Library-To-Be’s failure to secure likely website names has been the subject of speculation over future confusion. The future is now here. The anti-Bushite at theruminationsofoldnfeeble has confused georgewbush.org with the real deal, and is suitably outraged. “There he is. In all his finest, chest-puffing commander-in-chief regalia. Can you believe it? The one image you’d think they’d bury in the basement. The image that captures that “Mission Accomplished” moment from this endless, senseless, insane war Bush has drug this country into. 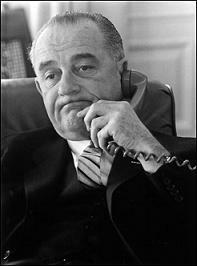 Thrilling new tapes from the Lyndon Johnson Presidential Library are released, showing his intense identification with Israel. All well and good, but tales of American presidents and the plucky Jewish State are beginning to get mushy. We’ve had Harry Truman’s recognition of Israel commemorated, a hideous Kennedy memorial defaces the Jerusalem landscape, and Johnson’s Jewish ties are being extended back to his first term in Congress. With some unfortunate photo placement. The effect of all this is to extend the current US role as Israeli’s godfather back in time, burying the whole period when France provided nuclear technology and most of their conventional weapons, and of Czechoslovakia’s arms during the War of Independence. The anachronistic centrality we are seeing starts is beginning to resemble the hemp cultists counting past presidents who grew the crop. Filed in AMERICAN HISTORY, AMERICAN PRESIDENTS, HARRY S.TRUMAN, HISTORY IN THE NEWS, JOHN F. KENNEDY, LYNDON JOHNSON, POLITICAL HUMOR, PRESIDENTIAL HISTORIAN, PRESIDENTIAL HISTORY, PRESIDENTIAL LIBRARY, PRESIDENTIAL MARKETING, PRESIDENTS OF THE UNITED STATES, UNITED STATES HISTORY, US PRESIDENTS, VICE PRESIDENTIAL HISTORY, WHITE HOUSE HISTORY | Permalink | Comments Off on Middle East? Middle Everything! 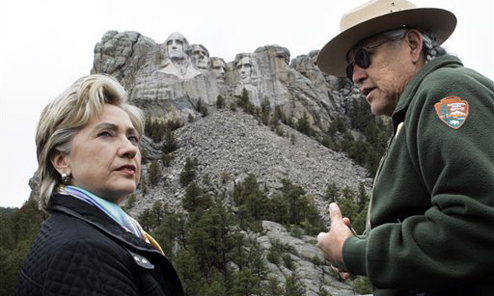 South Dakota’s favorite sons look down on an aspirant.